The bus was a bunch of sleepyheads on our first trip south down University Drive. Such foot-dragging and seat-slouching stood out since my day had begun hours earlier. It was Saturday, we were on our way, and it wasn't even 6 a.m.
At this time of day, everything is gravy. Passengers shuffle off to day jobs, time points are realistic, and the crush of congestion at 595 is a problem for future travelers. An hour later, when we depart West Terminal, the light is fresh and our day begins in earnest. At Commercial Blvd, a drooping profile waits with his briefcase. His suit reveals a natty fashion sense accumulated over untold years in the industry, but his footwear clinches the impression. For most of his trip, we will hear laconic reviews of the shoes he sells. When he tells us he has the best alligator and ostrich skin shoes available, we believe him. At Stirling Rd, a familiar crestfallen figure emerged from hiding in the shadow of the bus shelter. This had happened the week previous, when I was less prepared for this 20-something who was smooth-shaven and worry-wrinkled. When I'd greeted him before, tears welled up in the corners of his eyes and no words were given in return. 'One of those days? Hang in there.' My encouragement was premature and presumptive; the day was too new to have gone sour, and his muteness was no proof of discouragement. Still, it seemed to fit at that moment. Today I tried a different direction, to stoke imagination and possibility with my friend in the wide-eyed space cat t-shirt. "Yeah man, it's one of those days. I'm on a mission, man!" His smiling eyes and light slap on my shoulder were a complete reversal from before. His back straightened and he glided to his usual seat in the rear upper deck. At West Terminal for a mid-trip layover, I was off the bus for a stretch when a young Asian exchange student exited my bus and approached me. Another passenger was asking her for a date; he wanted to take her to the casino. In broken English she let me know she didn't feel safe, so I offered to call Security. She declined and opted to wait for the next bus, so long as he wasn't on it. Somewhere before Commercial, a young lady put $20 in the fare box before I could tell her we only sell day passes on the bus. I gave her a courtesy pass and scribbled the customer service number on back. At the north end oppressive clouds were massing as struggling and exasperated young men boarded along the way. The pattern of gloom appeared set in asphalt until our final visit to West Terminal, when a breath of fresh air in the form of a beaming smile came to the door. It was Mister, a long lost regular on the 36 who I hadn't seen in a long while. He was there to save the day from depressing collapse with a cheerful greeting, a fist bump, and well wishes. The beautiful Breeze. We have several limited-stop Breeze routes, such as those on US 1 and University Drive, but only one can be called The Breeze and be known immediately. It's the 441 Breeze, an hour and a half from end to end with no let up in between. The majority of operators who pick it soon dread their shift on this relentless, endless route. For the rest of us, it is a fantastic journey along the serpent's spine of State Road 7, with its thousand ribs leading mostly through parts the tourist board won't advertise. From Coconut Creek where luxury car dealers have formed a mecca of fine motors around the garish excess of the casino to freshly baking bread perfuming the concrete dust bowl at the gateway to the intergalactic interchange known as Golden Glades, this route will send you on a trip. At Hollywood Blvd, I serviced the stop and was ready to pull away when the daredevil appeared. His impressive whistle prompted me to look left and see a man on a bicycle defying the odds as he cut across the dense traffic of a chaotic construction zone. It took my breath away, and I feebly voiced what was obvious. "Life is an adventure. When it's your time..." The personal philosophy came with a matter-of-fact latino accent. He took care of the fare box and blended into the bus. The massive State Road 7 roadway project in Hollywood was only in its second phase, which meant a couple more years of Swiss cheese roads and tight, shifting lane patterns. Major excavations from Pembroke Rd to Washington St designed for enormous pipes an adult could walk through were effectively sheer cliffs right at the edge of the lane lines, with only flimsy barricades separating us. Where once stood businesses, closed and demolished for the sake of progress, now spread shapely storm water retention pits. While they would later smooth the edges and install grassy banks, for now the earth works exposed bare bedrock never before seen by man. The ancient limestone crusted yellow as a silent signal to future generations of shifting sands where our feet now tread. The sweetest time on the 60, doing the first bus of the day out of Central Terminal. Downtown still sleeps while the gears of the city wind up for a new day. The soft glow of crooked street lights pierces the dull darkness, artificial stars of human proportion. The sun hasn't thought to wake up yet, so we will make our own light. The regulars board at this time, folks with places to be while others dream in bed. Pulling out of the terminal, heading north up Andrews Ave, a street like no other if only for its vital conduit at the heart of Broward County. While gentrification makes its predictable march along the shoulders, the roadway itself remains cast in stone with lanes too narrow by today's standards. Time-scarred sabals tempt fate as they lean their shredded skins a hand's width away from the steady pulse of traffic. Buses better watch their mirrors along here, and ease over the puddle-collecting dips and buckles underneath. Jutting out at the visual promontory where the FEC RR meets the street named for its creator, Flagler Drive, sits Lighthouse for the Blind. The obscured bus stop there seems to have sprouted a strobe light this morning. It is a headlamp of a passenger waiting to load his bike on the rack, and determined not to miss the bus. I compliment him on his creative attention-getter while he feeds the machine for a day pass. We make our appointed trek uptown, with the usual busy spots at Commercial, 56th St, Tri-Rail, and Race Track Rd on the way to the Pompano transit center. Connections are made with other routes and the 60 then makes its most daring venture of the route, a sharp turn westward along Martin Luther King Jr Blvd. 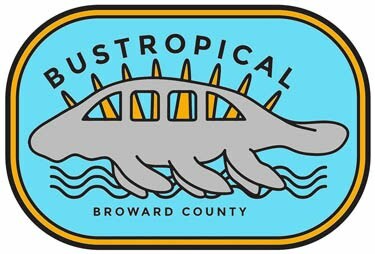 The road formerly known as Hammondville has recently received a permanent name change after decades of dual-name status evoking the history of a Broward long past. Next comes the Collier City loop, then over the Turnpike, followed by anxious concern from passengers since we don't enter BC North Campus on this first trip. From there it's a straight shot to 441 in time for the majority of those remaining on board to connect to the 441 Breeze heading south to Golden Glades. Two stops later we're at the north layover, where I and whoever's left wander into Dunkin' Donuts for some caffeine. The sun is starting to peek over the eastern edge as I return with cup in hand and a dark figure waits near the bus. I thank him for his patience and the floodgates are released. My policy is to make folks comfortable with being sociable so strangers can be instant friends. This young man dressed in black took his cue and came on strong. If I wasn't awake before, I had no choice but to focus up now. A raw blend of bitterness and resignation flowed freely as he settled into a seat up front, while I scalded my palate from sipping too quickly. Claiming to be oppressed, before detailing why MLK's dream is another man's nightmare, he soon resolved to leave the US. A side argument with a young lady defending MLK after this disparagement soon fizzled out, so he returned to me. The earlier vociferous introduction was now replaced with calm introspection. His polemic continued in an orderly process, wrestling with the mixing of the nations, promising not to hate me since I may have Moorish blood, and finally discouragement while desperately grasping for a foothold in the mystery of humanity. A few hours later I was making the same path as that first trip, servicing the Pompano transit center for the last time of the shift. An older man boarded, his casual Hawaiian button-down shirt providing a welcome splash of color against the drab trim of the bus interior. He stayed up front by the yellow line, bracing against the stanchion. "So, are you getting the hang of things?" It was a broad question to start with, the kind you might get later in a conversation. 'Hang of things? Where?' Rather than assume anything, I needed a clue. "Oh, the job in general." "I think the key word is adjust. Most things in life are like that." "Like me, I don't like riding the bus, but don't have enough for a car right now, so I adjust." An afternoon/evening shift on Route 60, the most brutal time of day to work that route. I wasn't supposed to be here, it was my regular day off and seemed like a good idea to get some extra work. Besides, I love the 60 through and through despite it being a high-maintenance relationship sometimes. In between requests from passengers to let them know when we got to the DMV, Sunrise Blvd, or Blount Rd, we had to contend with ever-growing traffic on ever-narrowing Andrews Ave. Lane closures at Prospect Rd dealt a devastating blow to any semblance of schedule-keeping. One lane at rush hour? Bad 60! The grind was briefly diminished when a regular from the 50 appeared, with his signature big floppy hat and winning attitude. A sign waver when I saw him in action, he's a fixture on Dixie Highway near the Pompano transit center. We were probably pushing 10 minutes down, not bad considering, but he took it in stride as usual without a hint of malice or resentment. Several hours into the marathon and we were in the thick of it. The frenetic activity of late afternoon came at us from all directions, conspiring to put the brakes on our forward motion. Then she was before us. A broken silhouette between the two large circles of her wheelchair, waiting patiently in Collier City. The angled shadows cast by the setting sun were focused on her, and now so were we. The impulse to rush came to a sighing halt as all due care was lavished on one who truly was dealt a lasting blow. Down kneeled the bus, up and out flipped the ramp, creating a bridge for her to rest her arms and be carried at least some of her journey. Fresh bandages wrapped the rounded end of what used to be an intact leg. She lined her wheels up at the base of the ramp, and paused. "I'm sort of new at this, so..." she explained with endearing vulnerability, fixing her eyes on the challenge before her as she tentatively wheeled herself on board. I offered to attach the securing straps to her chair, and she blessed me by accepting. The episode delayed us even more, yet curiously our time deficit soon shrank and was no longer an issue. After that, I picked up an infrequent regular who is frequently anxious to get to his destination. This time he was relaxed about it, perhaps because the day was done and he was on his own time. Usually sociable while on my bus, today he was quiet and reserved. Apparently he was reading the Bible, since another man inquired, "What the Scripture today?" His answer was a measured retelling of a passage in Joshua about the day the sun stood still. Sunny, rainy, sunny. A settled pattern with unsettled weather of a Sunday on Atlantic Blvd. A relatively brief east-west route in the narrow north end of the county, the 42 bridges the length between A1A and the western suburbs. While weekday afternoons are notoriously unreliable during the relentless congestion where schedules become fodder under so many axles, the weekend version runs like clockwork. Regardless of the day however, some things never change. Approaching the Magner warehouses near Powerline, the slim figure of a young man went skipping across the entire width of the boulevard - six lanes and a sizeable median. Once across, he waved for the bus, and anticipating this was the reason for the mad dash I was able to make the stop. "I lost my bus card, can you gimme a ride to the next stop?" At this point where the surface street intersects with Andrews Ave and I-95, the next stop is a good half mile away. Perhaps I hesitated too long in my generosity, since he felt compelled to go on. I wished him a happy birthday and kept it moving. At the east layover, there was ample time to secure the bus and take a needed walk. Glancing out over Atlantic Blvd's namesake, the shimmering shallows lapped silently in the morning light while pleasure craft drifted a couple miles offshore. A small cluster of cyclists sped by on A1A. That part of the beach has no dedicated parking lot, so limited street parking is the only option. A SUV was having some difficulty maneuvering to parallel park, taking repeated attempts to fit in the slot between other vehicles. The teen girl in the driver seat looked focused yet a little overwhelmed. Her bumper sticker read: Student Driver. Please be patient. Halfway into the shift, I heard a disturbing call over the radio: the other 42 bus driver had a passenger who urinated on the bus and he was instructed to return to the garage. At that time there were only two buses on the route, and after that call I was the only one out there. This hadn't happened before so I wasn't sure what to expect. I figured we'd be ok the rest of the trip, but after that was anyone's guess. Sure enough, the complaints started to come in, repeated refrains of waiting 2 hours for the bus. I apologized and sympathized and kept it moving. An elderly gentleman with a walker concerned me; he needed to get to his wife in the nursing home and now would have little time to be with her. Late in the shift I picked up a familiar face, not from the bus since I only picked her up a couple times before, but rather from a friend's art show a few months earlier. An older woman with a trademark ball cap, we'd been introduced and she named another driver she was fond of on another route. Now I asked her how our mutual friend from the art show was, and she gave a confused look, not knowing who I was talking about. She didn't recall me, or the art show either. "I can't remember one face from the next." She admitted with regret. 'That's ok, as long as you remember who you are, and don't lose track of that.' She knew that much, found solace in it, and kept it moving. Early morning bus operators don't start bright and early, they start dark and early. The weekend shift on University Drive came with a predawn report time and light traffic on the way to my start point. Accompanied by the thinnest sliver of moon in the east I made my way to Westview Drive in Coral Springs. Off we went, smooth as could be down to 207th St in Miami Gardens, in the shadow of Dolphins Stadium (or as we'll always call it: Joe Robbie Stadium). The earlier trips take less time but you've got to expect it's gonna take awhile to get from the top of Broward County down to the top of Dade County; this trip would take just over 1 1/2 hours, later trips take close to 2 hours. The way back up included a visit from a waitress regular who zoomed into the stop on her bike just ahead of the bus. She was the fun aunt today, picking up her young nephews way up the line. A three car accident outside the Coral Square Mall somehow found two of the cars up on the median. After the wreck, it was nice to see someone on our next trip who had it together. The multi-color embroidery on her fine blouse of deep violet complemented her Trini complexion. We said our greetings, and she continued, half to me and half to herself. "You gotta say you're ok even if you're not. Gotta fake it till you make it." There was a crack in the manicured facade of Coral Springs here. It was refreshing to be reminded by this woman's basic revelation in the land of perfection that all that glitters is not gold. The south end of the route has its own lived-in flavor, far from the lush satisfaction of the north. A mobile juicer in his red pick up roams the streets, the battered bed loaded with sugar cane stalks poking upward over a mound of coconuts. A single-engine plane takes off from North Perry Airport, unfurling an enormous orange banner to advertise in the sky. All routes change along the way, and these longer routes change more than most, especially with the weather. A dry broil around the county line gave way to monsoon conditions from Davie to Ft. Lauderdale. It was tapering off but still drizzly when we got to Joe's Crab at 44th St in Lauderhill. A somber figure draped under a towel stood at the stop, dripping under the clouds. The face of a young man emerged out of the improvised umbrella as he boarded, discouraged and resigned to the whims of Mother Nature: "This was my beach towel..."